Heat wave conditions continued to prevail over some parts of Rajasthan, West Madhya Pradesh and adjoining north Maharashtra. They have also developed over some parts of Haryana, Delhi and East Uttar Pradesh. The day temperatures are 5-6 °C above normal over this region. This heat wave bodes well for the orderly tranformation of weather into the "pre monsoon" stage soon. Any prolonged cooling of the north, like last year ,would have been a cause for delay in the monsoon.The heating of the plains, now, is a must for the Low Pressure to build up in the next 15 days.This seasonal low in mid April will be induced by the pre monsoon heating of North Pakistan and Rajasthan. With the W.D. now having been shunted North and getting spent out, a second major heat wave could be expected in the second week of April,and the mecury will peak to levels of 4-6° above normal. On the Bay side, normally,the month of April witnesses about 2'' low's'' developing (these may even become cyclones like the one last year). 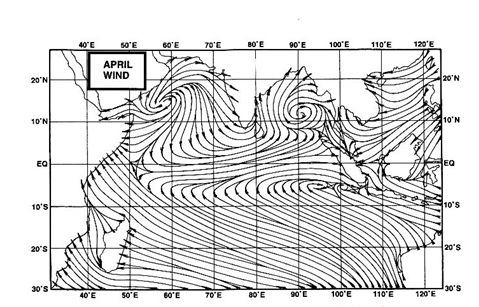 A warming Bay of Bengal may detect the first ''Low'' around the 15th.This too is a pre monsoon feature. If these developments move as per schedule,with a'' low'' in the Bay forming in the middle of the month,the wind pattern across the equator may change faster than expected,and we may see the monsoon, forecasted today maybe, a week early. We follow up with a next review after 5 days and observe the progress.